If you are working with infopath forms and your form is really big [I mean, having lot of controls and with so many actions] then you should get this error at some point. Most of the developers did not get it as it will come very rarely. "This session has exceeded the amount of allowable resources." per request. This value is configurable and can be changed by the administrator. So, when we see the log description, it is saying that the form actions is beyond the SharePoint default form actions allowed. 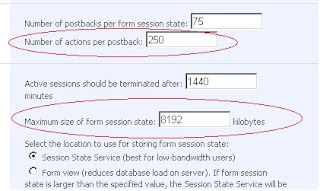 SharePoint by default allows 200 form actions per postback of a form. But, here the form I have used is using more than 200. My case it is 208. So, it will not allow to save or submit the form and throw the above error. To resolve this error, increase the form actions in configuring infopath services section as shown below. Go to Central Administration of the SharePoint server. In the section "Infopath Forms Services", select Configure Infopath Forms Services. In the Number of Actions per Postback enter the value of what even viewer shown[In this example 208] or enter some max value around 250 or 300 depends on your requirement. There are chances that the error may retain same even after we increase the number of actions per postback. 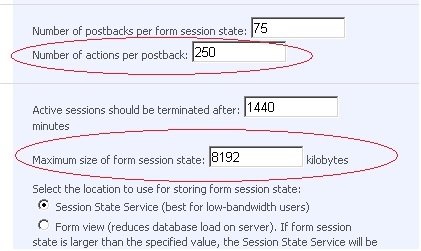 The second thing we have to increase is the value of "Maximum size of form session state" to 8192. By default it is 4092, by increasing it to 8192 the error should go away. Please let me know, if you have any problems or questions. Hope this will solve the problem. You should even check the number of postback allowed...and increase the value in threshold.